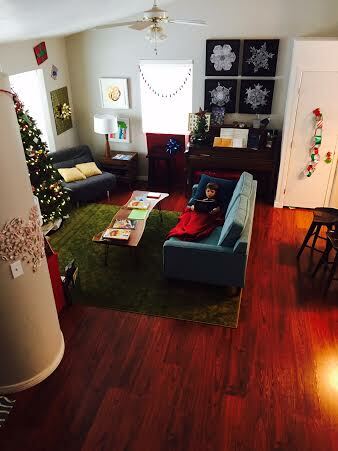 Our Christmas Corner is Cozy City right now. I'm loving it. All i want to do in my life is sit at the couch and read Christmas stories while listening to Christmas music. Maybe play a game if I can get anyone to play. Julian busted out the chess board the other day and boastfully exclaimed how goood he was at chess and how he wins every time. I said, "not so fast." He did win the last time (and first time he's ever played) but that's because I helped him too well and, as we know, I always lose when I play against myself. I was helping him along, helping him along, until I paused and said "Sean, could you help him? I feel compromised and conflicted." Which he did, but then I continued to give tips and then, at the very end when it got very intense and exciting, they went for it and got me. I then went on to explain, "See what happens when you play to win, Sean?" He loves it. So Julian continues to think he's a chess master and maybe he's right. Other Jen is a really good teacher. SEAN: Josh Groban just does not appeal to me intellectually. JEN: Ha ha. What do you mean? SEAN: I do not like his voice. So I don't understand why the rest of the world does. JEN: Yeah. It's like James Taylor. He is trash. SEAN: Yet so many people love him. JEN: I can't explain it and never will. He came on the other day and I went into such an immediate blind rage, i snatched my phone and, in my haste and fury to shut him down, fumbled with it in my hands like a hot potato. Couldn't do it fast enough. And with that, the coziest picture if Christmas Corner and of Julian waiting for me to come down and read him a Titanic book, which has experienced a bit of a resurgence, I'm happy to say. God bless us, everyone!